Today, an antivirus is a must install piece of software to protect your computer against online threats. Although there are no antivirus applications that can guarantee 100% protection all the time, it can offer a high level of protection up to more than 90% depending on the type of antivirus software that you use. There are quite a few brands that develop antivirus software and they don’t all have the same capability. It is generally safe to say that a good antivirus is one that is most being used such as AVAST, which is currently the most downloaded software in CNET’s Download.com followed by AVG. 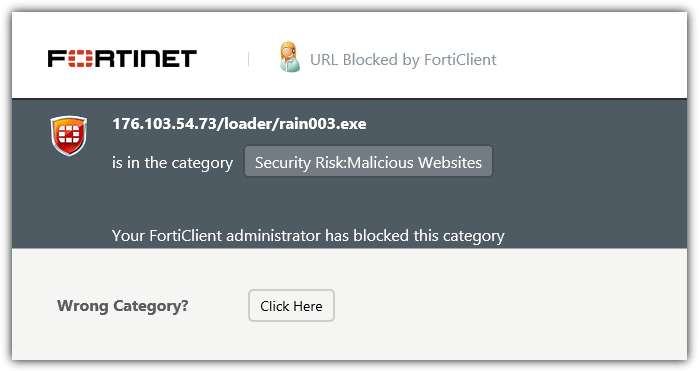 We’ll be taking a look at a lesser known piece of antivirus software called FortiClient developed by Fortinet, a company that specializes in network security hardware products. There used to be 2 different versions of FortiClient which is the paid Standard and the free Lite version. However in the current version 5, they’ve dropped the different versions and made the single FortiClient free. Basically the main features found in FortiClient are the real time antivirus with advanced heuristics, a web security module which protects you against certain types of websites by category, and a VPN Remote Access which is mostly not used by home users. The firewall module has been dropped from FortiClient. First we’ll take a look at the effectiveness of the antivirus engine. It has actually won numerous awards from different antivirus testing agencies. FortiClient has been consistently awarded from AV-Comparatives since 2012 and they recently received an ADVANCED+ which is the highest rating in the file detection test. 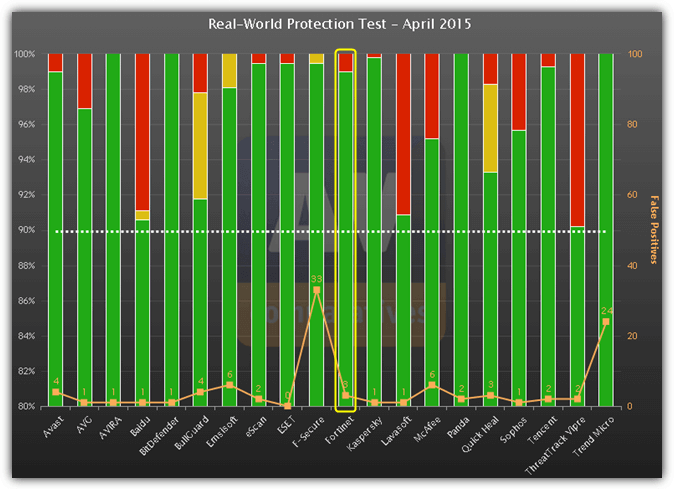 Other than that, FortiClient successfully blocked 99% on the April 2015 real-world protection test, beating other popular competitors such as AVG, BullGuard, Emsisoft, Lavasoft, McAfee, Quick Heal, Sophos, and Vipre! VB100 is the most well known comparison test performed by Virus Bulletin. FortiClient has earned 9 out of 10 VB100 award in the last 12 tests with 2 tests not entered. In fact, the full test history shows very clearly that FortiClient did quite badly in the beginning and it got better with only 2 fail out of 22 tests since June 2010. The version 5.0 of FortiClient has achieved AV-TEST award for the whole 2013 but oddly has stopped participating after that. PCSL is a company from China consisting of a team of passionate testers and researchers. They have conducted many different types of tests such as cleaning test, android malware detection test, desktop browser performance review, exploit mitigations test, and etc. 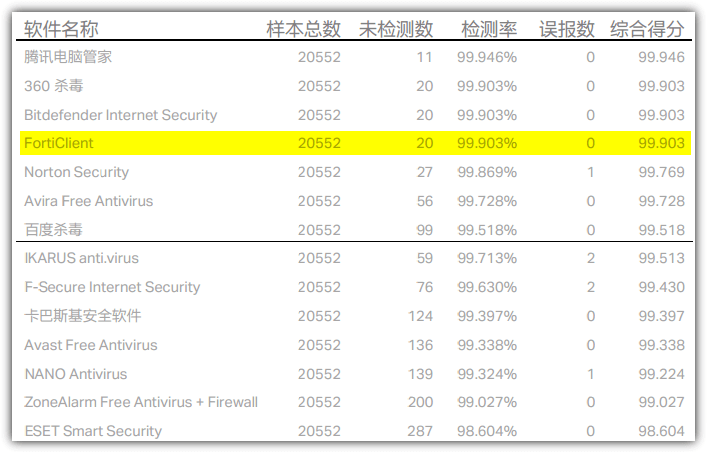 The “Desktop Malware Detection Test” conducted on December 2014 has FortiClient included in the report and it achieved 2nd place with 99.903% detection and 0 false positives, missing merely 20 samples out of 20552. A summary of 5 enterprise products being tested by NSS Labs dated back in 2014 shows that FortiClient successfully achieved a 99.8% block rate, with 99.4% blocked on download and 0.4% blocked on execution. This figure puts FortiClient in the 2nd place in par with Bitdefender while the first place is taken by Symantec. We’ve also performed a very simple and quick test to see the effectiveness of FortiClient in blocking/detecting new malware samples. We’ve downloaded 10 latest samples from VX Vault and FortiClient instantly detected 6 out of 10. As for the remaining 4 samples, they were successfully blocked from downloading to the computer by the Web Security module. With all the certifications being awarded by different independent testers to FortiClient, we can tell that FortiClient is very good in detecting and blocking malicious software. The second major feature found in FortiClient that makes it even better is the Web Security module which acts as a web filter. It has 6 different main site categories and each category expands to a more specific type of websites. You can easily change the configuration either to allow, block, warn or monitor by clicking on the icon and select the appropriate command. A specific website can be added to the exclusion list if there is a need to access it but is in a blocked category. There is not much configuration found in FortiClient and most settings can be left at the default. There is a backup/restore configuration, logging, enabling VPN before logon, using local certificate uploads, enabling detection for programs that belong in the grayware category such as an Adware and Riskware, and etc. Do take note that the “Enable WAN Optimization” option will only work if you are connected to a network with a FortiGate device configured for WAN optimization. Most of the time this option is not needed at home. Another useful feature is the ability to lock FortiClient with a password to prevent from pausing the protection or closing the program. The settings are also protected and cannot be changed when the configuration changes is locked. With a quick glance in terms of performance, FortiClient creates 9 background processes and taking up less than 20MB of memory usage on Windows startup. The memory usage does not increase much when the computer is idle and only goes up when there is activity such as scanning a file. 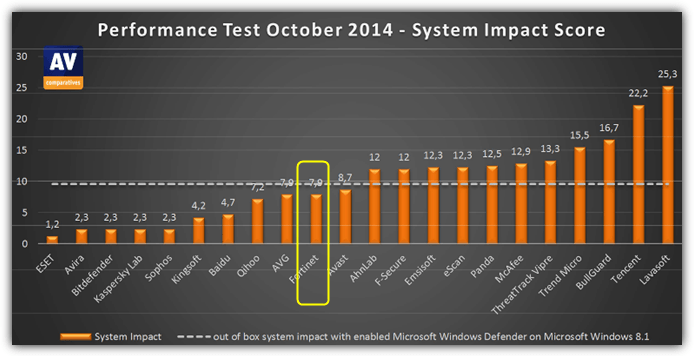 A slightly dated performance test by AV-Comparatives shows that FortiClient offers better performance than the out of box system impact with Microsoft Windows Defender enabled on Windows 8.1. 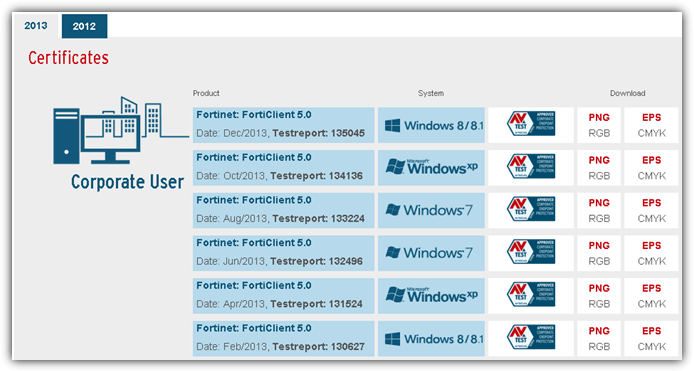 FortiClient is available for Windows, Mac OS X, iOS and Android. Closing Words: FortiClient offers very good protection against malicious software and a superior web filter for free. The only thing is we couldn’t get confirmation from Fortinet if the free FortiClient can be used commercially. 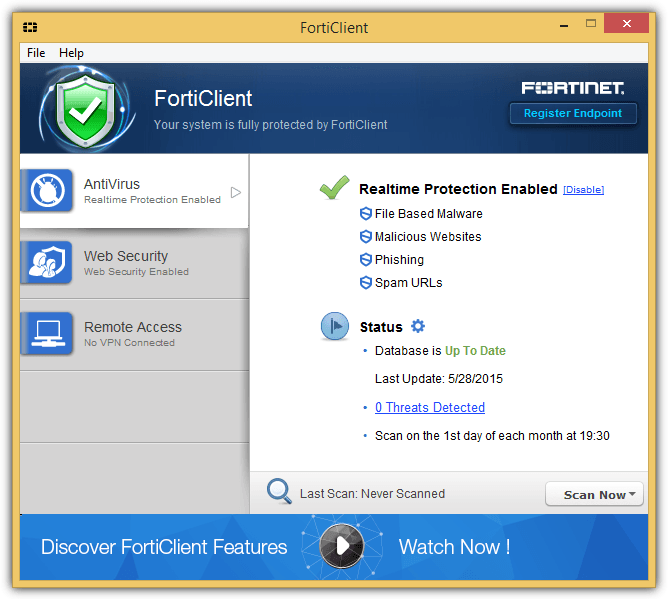 FortiClient is definitely a good alternative to other free antivirus software such as Avast, AVG, Avira, etc. 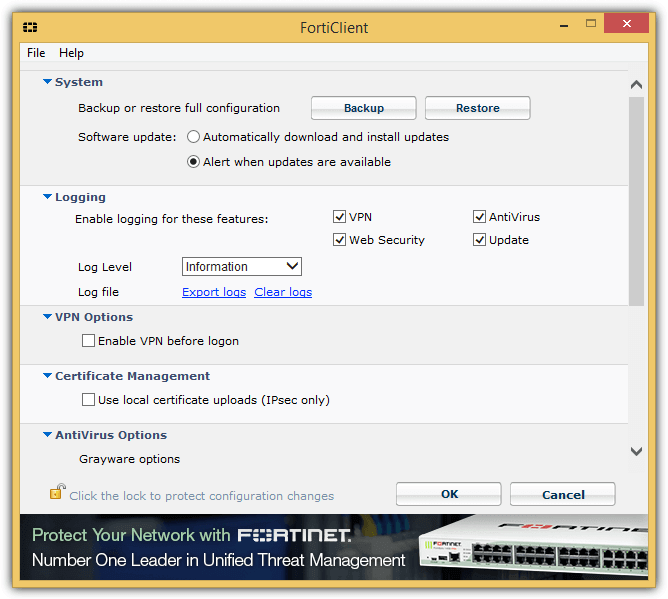 I have a client that uses Fortinet/FortiClient for remote access to their network. Can you please help me understand if this solution is secure? Any Pros/Cons to consider? I was hoping to use LogMeIN instead. Any feedback is much appreciated! I have used Forticlient on my home personal computer off and on for about 3 years now. I do not use it all the time because I am in the computer security field and am always testing AVs. I first used Forticlient shortly after Fortinet made it available to users for free. It has been greatly improved since then. It now includes an exploit shield, a vulnerability scanner, and some behavior blocking detection. Unlike many of the better known AVs, it prevents the user from accessing many of those web sites that harbor one of the “your computer is infected” support scams via its excellent web shield. The web shield frequently is one of the few detectors of new malicious web sites when I check them with Virus Total. I heartily recommend Forticlient to other users. We are considering our options at the moment and considering Forticlient.. It is a greatly improved product from when we first looked. For the record as of 3/2017 Forticlient is free to use in a business Enterprise environment per our reseller. If you want central management is where they currently charge and that is actually cheap. Thank you, have switched from Vipre to FortiNet. The only thing is we couldn’t get confirmation from Fortinet if the free FortiClient can be used commercially. hi ray thanks for the review..
i also satisfy with ray because its true .